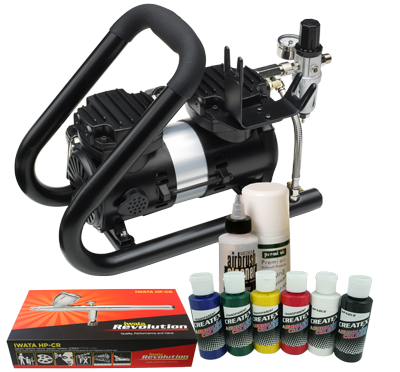 This kit contains everything you need to get started in airbrushing T-shirts, leathers or other fabrics. If you want to learn how to use your airbrush kit quicker and get expert tips, or if you want to try the equipment before you buy, please consider our hands-on airbrushing courses. With the world-renowned, unsurpassed quality and performance of Iwata professional airbrushes, this kit includes an Iwata Studio Series Power Jet Plus Handle Tank compressor, an Iwata Revolution CR airbrush with 0.5mm nozzle, Createx textile colours, airbrush cleaner and a 'how to' booklet.